This is my second installment in the series of words that I can never seem to remember the meanings of, no matter how many times I encounter them. Repetition is supposed to be a major key to learning. Then why don’t multiple trips to the dictionary make me remember these, any more than Bart Simpson’s 100-repetition blackboard scribbles make him behave? I’ve decided that blog posts are the answer to my dilemma. Perhaps Bart’s teacher should make him write a whole essay? Today’s my-thick-skull words are “limn” and “limnology.” Having looked at the etymologies for them, I think my confusion around these two terms results from the fact that they have absolutely nothing to do with each other. “Limn” means to draw or portray (either with words or physical media) and comes ultimately from the Latin word for illuminate (inluminare). “Limnology,” meaning the study of bodies of fresh water, comes from the Greek word (limne) for pool or marsh! How is that fair? While the fresh-water science wasn’t named until 1893, the draw/portray sense of “limn” has been around for five or six centuries. One can see the progression of the meaning if she knows that there was another use of limn, now obsolete—to illuminate a manuscript. It’s easy to understand the transition from a meaning of illuminating with light, to illuminating a manuscript with drawings, to a general sense of “to draw or portray” for this word. 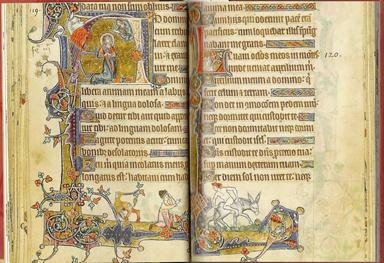 Below, the Macclesfield Psalter, believed to have been created in 1330. It is considered a national treasure in Britain, and is a beautiful example of medieval manuscript illumination.